At last, the first cravats tests from Spoonflower have arrived! Some of the colours are very good, some less so. But it was always a learning process anyway, so it’s easy enough to put them right and more forward from here. 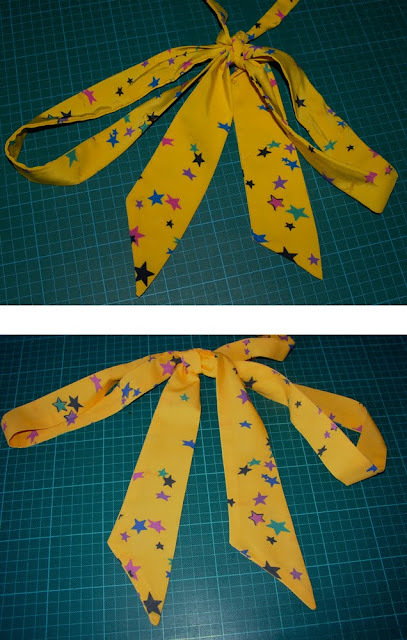 The first cravat I am going to have a go at making up is the yellow star version (see right). The Yellow cravat is a little easier as it is cut with the grain of the fabric, unlike the polka-dot ones which are cut on the bias. The bias will be a little tricky to work with as it will allow the cravat to stretch and skew while I am sewing, so for now I am going to keep it simple. First I need to cut out all the pieces (see left, top). I have made it in two parts, which are sewn together then folded along the length of the cravat and stitched to the final shape. The original was frankly made in a bit of a mess, with a number of joins along its length, some quite close together. This all looks very pointless and as if it had been cobbled together with fabric scraps or had been changed in length after it had been first sewn. I have decided not to blindly follow this, rather I will make a cleaner, more simple design. Its a simple case of sewing the two halves together with a short line of stitch across the width (see left, middle) and press the seam allowance flat. I then fold the cravat in half lengthwise and pin it in place (see left, bottom) before sewing the entire cravat closed, bar a short gap through which I turn it right-sides. I have also “corrected”another error in the original. When I compared the two end of the screen -used cravat, I discovered that they were not cut to the same angle: one is more pointy than the other (see right). This is a little odd, given that the polka-dot versions are exactly matching. A then quick pressing and the job it done – all a lot trouble free and easier than I thought. Here is a direct comparison between the screen-used cravat (below, top) and my replica (below, bottom). If you are interested in buying a replica cravat, they are available for £30 singly, £55 for any two or £80 for all three.